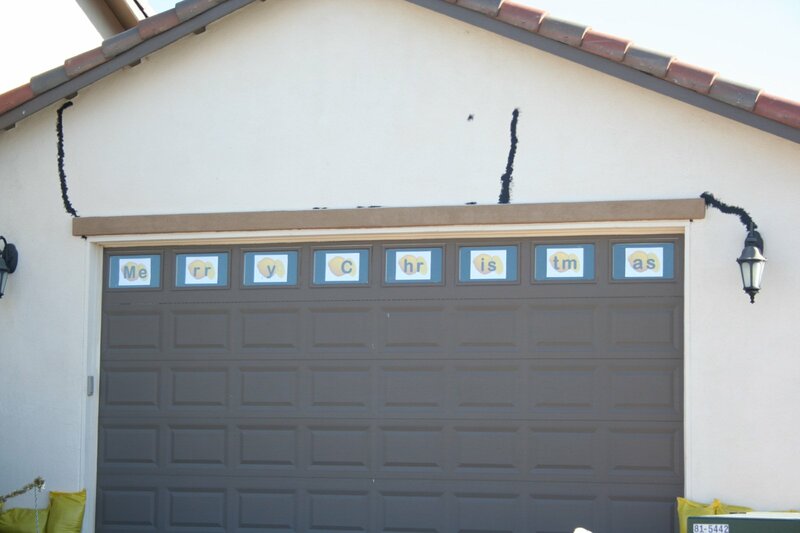 I got a tip from a reader that the owner of A Syncon Home, who is hopping mad over construction defects in his new house, had put up Christmas decorations. I swung through Minden today, and indeed he did. 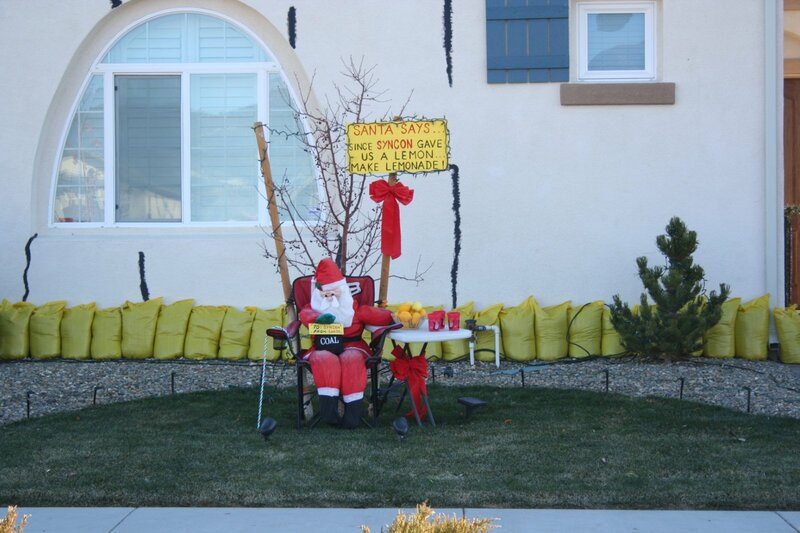 Santa says… since Syncon gave us a lemon make lemonade! 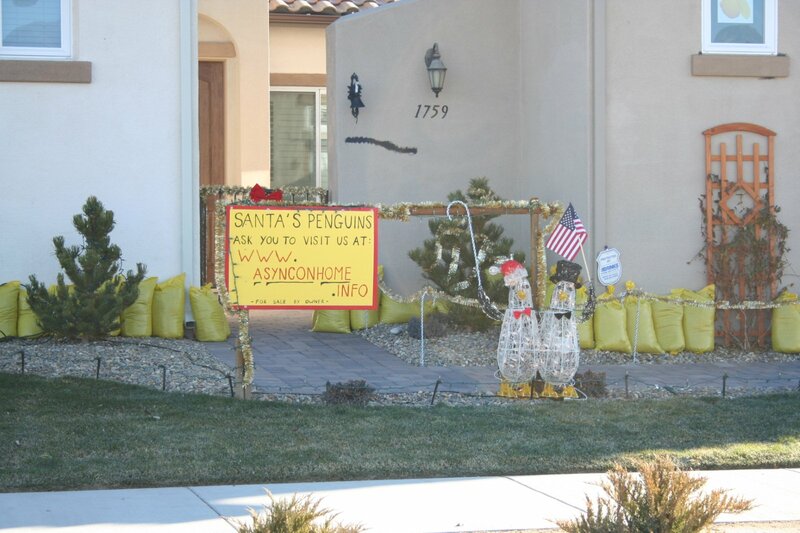 Sanata’s penguins ask you to visit us at www.asynconhome.info. 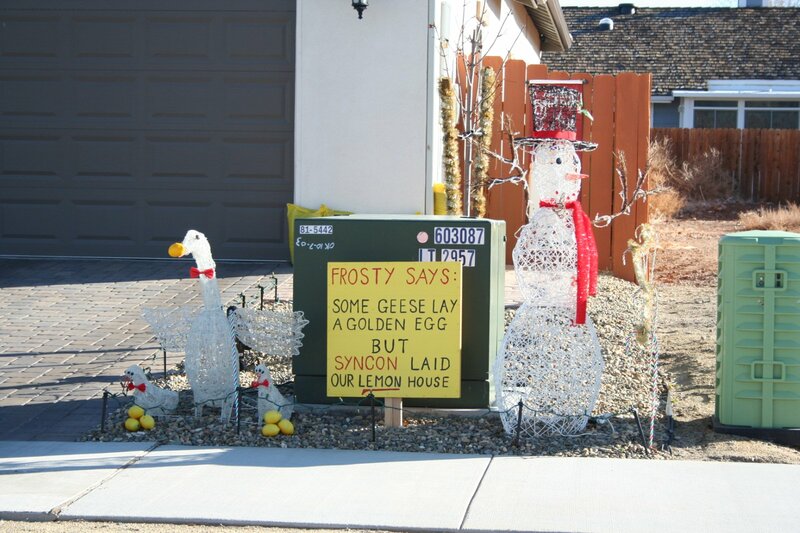 Frosty says: Some geese lay a golden egg but Syncon laid our lemon house. Supposedly there is more to be seen at night. I’ll have to go by after dark and see, maybe after the Parade of Lights on Saturday. I live next to this yahoo and he is a joke. He is retired and just likes to make a fool of himself. Who would go through all of the trouble to put signs on their car and park it in the same spot every day outside of syncon homes’ office. People do not like you, go back to LA!!! You asked: “who would go through all of the trouble to put signs on their car…..etc.” Well, if you are seriously asking that question, then I can only surmise that your complete and utter lack of understanding of another person’s position is exceeded only by your total ignorance and insensitivity to this person’s possible situation. Not one person that I have ever known would have the urge to unnecessarily draw negative attention to him/herself in an obvious manner. I’ve never come in contact with any individual who would purposely “make a fool of himself” as you stated in your ignorant post. Instead of maligning this individual, why don’t you attempt to place yourself in his position and truthfully admit that you (and anyone else) would NEVER want to be placed in his position at any time in your life. Picture this quickly – You’ve worked your entire adult life saving money for retirement. You’re finally able to do so and you purchase a home. Soon after moving in, you discover that your house was built with fatal flaws. You ultimately discover that – literally – a birdhouse is constructed with more skill than the house in which you’ve just invested your life savings. I could go on and on regarding what this person must be enduring. But, I won’t. Be honest – you would feel the same way this homeowner does. You, in your lifetime, have probably never heard the saying, “walk a mile in my shoes.” So, take a life lesson from this ……don’t judge other people until you have: 1. Walked a mile in their shoes 2. Made the effort to talk with the person to understand his position/point of view prior to cruelly judging him. By the way – as far as I’m concerned, this person is doing everyone else a favor by informing them of his experience. If you were going to buy a house from someone, wouldn’t you be interested in finding out all the information you could prior to plunking down your hard earned money for that kind of house? Lastly, addressing your other tasteless statement, I don’t think this guy cares whether anyone “likes” him or not. He’s got problems that you wouldn’t wish on your worst enemy…………well, maybe YOU would…………..
All my sympathies go out to him……..and not you. I just received an email through my website today. It advised me of a post by “Jeff” and a response subsequently posted. I thought I’d comment to clairify a few issues. After reading “Jeff’s” post, I guess our revelations must be uncomfortable for him. It appears that he’s quite upset. I’m truly sorry that he feels that way, but I have no control over his emotional condition. It appears to me that “Jeff” is either a Syncon homeowner who is lying about his identity because he can’t defend his accusations or he’s someone else who is using a false name to cover his true identity for devious reasons. It’s even possible that he may be representing Syncon Homes. WE DON’T KNOW WHICH OF THESE CONDITIONS IS TRUE. However, we do know the names of our neighbors and there is no “Jeff” who lives “next” to us. In fact, we have empty lots “next” to us and nobody on the entire street, including across the street, is named, “Jeff.” It says a lot about “Jeff’s” unwillingness to stand behind his statements and it questions his true motivations. It even says something about the entire post when the very first statement is verifiabley untrue. No matter who you are, what beliefs you hold and what your motivation is, I’m truly sorry that you, “Jeff,” are upset by our pretest. However, I am not the cause of the underlying situation. I am the victim forced to bring it to the public’s attention as guaranteed by our Constitution. “Jeff” if you are a true believer in the American way of life, you should understand the founding concept of Free Speech. Our founding fathers established that freedom so that citizens could bring their grievances to the public’s attention. It is a protection provided so that the less powerful could not be bullied by the more powerful and that those in the minority could live without fear of reprisal from the majority. If you don’t believe in that founding concept, there’s nothing I can say to you. We don’t think, “yes,” is an appropriate response. Instead, we think other actions are appropriate. One of these actions is to bring our grievances to the public’s attention, as envisioned and protected by our founding fathers. It’s partly accomplished with our sign that you find so distasteful. Since we started bringing our protest to the public’s attention, you might be surprised at the overwhelming support we’ve received from broad parts of the community. We did not seek them out. 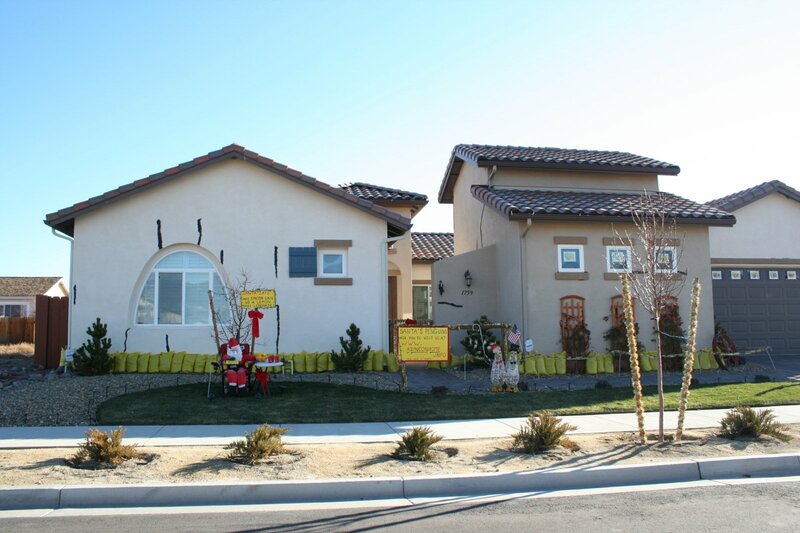 They contacted us with stories about their personal experiences and knowledge about Syncon Homes. We have and will refrain from posting the stories we’ve been told since we don’t have personal experiences with them. However, they are the kind of things we would have liked to have known before we entered into a transaction with the company they described. The problem is that none of these experiences were available at the time we considered Syncon Homes. Since we can’t turn back the clock to save ourselves from the quagmire Syncon Homes has caused to engulf our lives, we can only try to help others who might be following in our footsteps. We can offer to the future what the past didn’t offer to us – our experiences with Syncon Homes. Future people can chose to accept or reject the information we provide and then make their own decisions. It is all that we ask and it’s all that we’re doing. We’re just offering a resource to the future and making it available to the public. “Jeff,” if you happen to actually be Syncon Homes, we can also understand why you don’t like our protest of Syncon Homes’ behavior. It’s apparent why you would want it hidden from the public’s view. However, it’s happened by your own hand, so you must live with the consequences of your actions. “Jeff,” if you’re an owner of another Syncon-built house, you also need to realize that we’re not the ones that created the problem. We’re not the ones who we believe were provided a product different than Syncon Homes advertised and promised. We’re not the ones who many see as having created a quagmire of defective construction and despicable denials. Those vile honors belong to Syncon Homes. Instead, we’re just the ones who will not cower from Syncon Homes. You may be of the mindset to have chosen a different path than us. You may have chosen to capitulate. You may have chosen to remain quiet. However, you cannot deny our right to exercise our constitutionally guaranteed rights that countless of our forbearers died defending. You cannot deny our right to air our grievances, especially in the reasonable and guaranteed fashion we have chosen. As for your assertion that “people” do not like me. All I can say is that you’re misinformed. The people that matter to me like me just fine. An accurate statement would likely be that Syncon Homes doesn’t like me and/or that you don’t like me. That’s fine with me. I don’t live for you liking me and I don’t see it as a loss. Your motiviations are questionable at best and your statements reflect poorly on you. So “Jeff,” rest assure that I will continue with my constitutionally guaranteed actions. If I can bring attention to my protest and help others to make informed decisions, whether they ultimately choose to buy or pass on a Syncon Homes’ house, I will feel that I’ve done my part for the future. At the very least they didn’t make their decision from a position of misinformation of a lack of information. Oh yes, one last comment. If you’re going to make accusations, at least try to get your facts straight. Your claim of “every day” is far off base and goes well towards bringing your motivations into question.